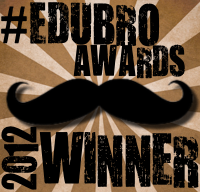 There has been quite the back and forth over the past month regarding the pro's and con's of awards in education and the edublogosphere. 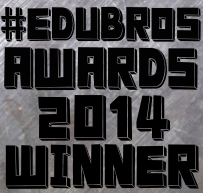 This post isn't about whether I am for or against them, it is about why this conversation resonates year after year. When I first started going online to learn from other teachers I started looking for class blogs that I could steal ideas from. Soon I noticed others looking at my class blog and even sometimes commenting on something I posted. This was (and still is) an incredibly motivating experience, a kind of peer approval badge. In effect, someone like me liked what I was doing. I suspect many of us have felt out of place before in our schools. We tend to be the "geeks" or "nerds", not usually the most popular (and yes, even as adults that makes a difference so don't bother protesting.) But, when we found each other online things changed. We became much more than popular, we became accepted. We became family. I am not saying that we are sympathetic protagonists that changed from caterpillars to butterflies when we created a PLN cocoon. It is just that we now live in what we covet for our students, a community of people that truly care and share with each other. We have discovered that the real value of the internet is in how it can bring us together, not with content delivery. 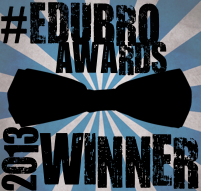 So, what does this have to do with the aforementioned debate over blogging awards? The tone of the debate is more important than what the debate is about. Our community is building fences. Robert Frost understood when he wrote "something there is that doesn't love a wall" that walls are isolating. I don't want to be isolated anymore, I have lived most of my life being alone (even in a room full of other students). Good fences may make good neighbors, but they make lousy families. Something I don't do enough is intentionally read education books. I mean I have them and sometimes will read a chapter or so, but I have no real intention to read the whole book and really think about the concepts. So this year I decided to join ASCD, and actually do some reading. 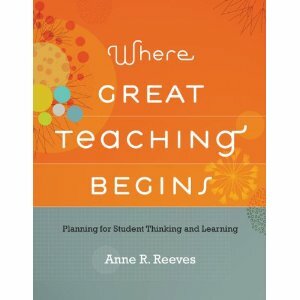 The first book I received from them is Where Great Teaching Begins by Anne Reeves. I am committing myself to reading and (more importantly) thinking about this book and as such I am going to write a blog post for each chapter. Here are my thoughts on chapter one. Reeves identifies the purpose of instructional design to make student learning the focus of planning. While this seems like a 'duh' statement, it really hit me. I have always been the guy that says I can link any activity to curriculum. You want to watch a movie about space pirates that become furniture movers, I am the guy that can tell you how to justify it. Obviously, this is a real problem. I am probably changing my teaching assignment next semester and am already trying to make a plan for how I want to teach the year. Since I am a big history geek I am planning on using that as my big theme and tying in the rest of the curriculum into it. I don't think that will be very difficult, but I really have to make sure I don't pick activities that I want them to do over choosing the learning they need. My plan is to have a broad outline of the year in place before Christmas so I can start fitting in the learning my students need (see, I am already applying what I am learning from the book :). Another thing that struck me about this chapter is the last section "So Who Are Lesson Plans Really For?" The answer is for the teacher, administrator, and the students. When I read it my first thought was about having students help write the plans. It would seem that the persons most effected by the plan should have some voice in it. What do you think? Reeves, Anne R.. Where great teaching begins: planning for student thinking and learning. Alexandria, Va.: ASCD, 2011. Print. Mrs. Smith (our Art teacher) and I have teamed up to create an interactive art "museum" for our students' work. This is how we are doing it. Mrs. Smith chooses are work that she thinks best illustrates what she is having her students do. She then puts it on the "art museum" wall. I take the student and have them explain to me their artwork. He/She tells me about the work, what they did, and what they learned. Then we record the video. After the video is recorded I upload it to Youtube. This is a real hassle because it is blocked at my school. I put the video in my Dropbox and then when I get home I upload it to Youtube. I tried uploading the video to Vimeo at school but discovered that to watch it on a mobile phone I had to use their paid service which is about $60 a year. After I upload the video to Youtube I go through the settings and make sure that the video is Creative Commons licensed, that comments are moderated, and change any other settings I think is necessary. 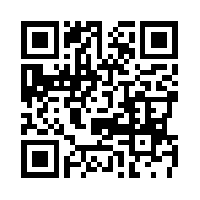 Then I get the url and put it into a QR (quick response) code generator. 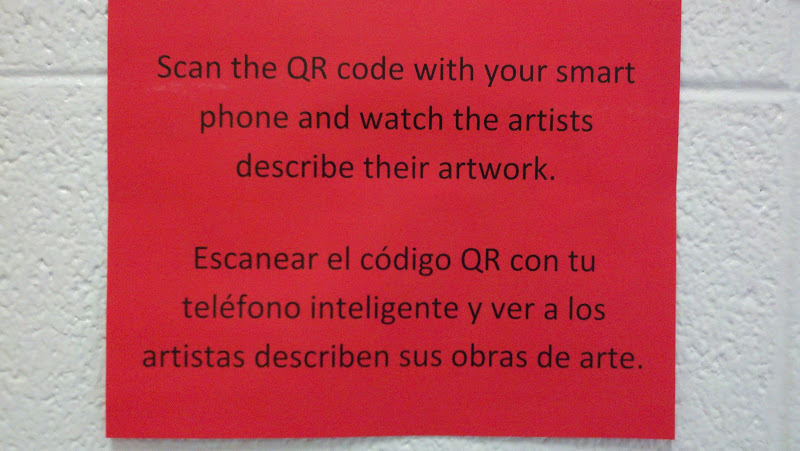 I use QRStuff to create the codes, but I doubt it matters which service you choose. 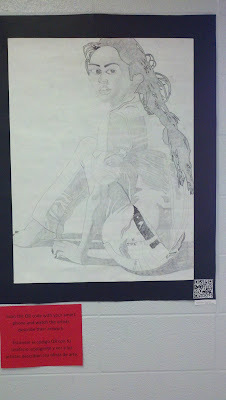 Finally, I print out the QR code and put it next to the art work the student created. 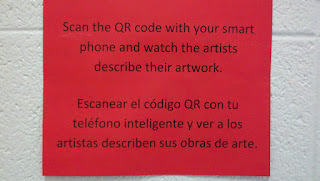 Now when someone comes along and wants to know more about the art work they can simply scan the code with their smart phone and instantly start watching a video of the artist explaining his/her work.